Earth is inside a solar wind stream flowing from the indicated coronal hole. Credit: SOHO Extreme UV telescope. The space shuttle and the ISS are orbiting Earth. Would you like to see them? Sign up for Spaceweather PHONE. AURORA WATCH: A solar wind stream is blowing against Earth but, so far, it is blowing too weakly to cause a geomagnetic storm. Auroras are unlikely tonight. French astronomer Laurent Laveder photographed the transit on July 9th. "I was so nervous," he says. The space station travels 17,000 mph and takes less than 2 seconds to cross the solar disk. There was no room for error, but "I was in the right place at the right time." CUMULO-MENACE: If you think this cloud looks menacing, you're right. It's a cumulonimbus cloud. Inside it, water vapor is condensing into water droplets, releasing heat to power violent thunderstorms, lightning and even tornadoes. 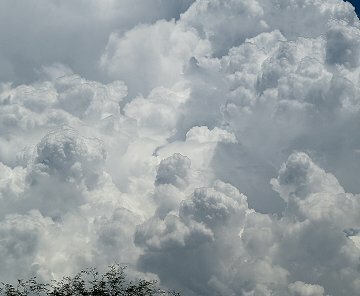 "Shortly after the photo was taken (on July 8th), a severe thunderstorm hit the greater Tucson area," reports photographer Robert M. Elowitz. Cumulonimbus clouds can rise to staggering heights, 70,000 ft or more. If you see one, admire the view, then take cover.